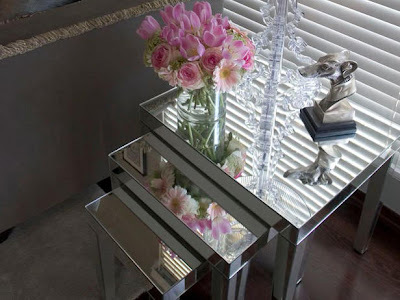 I suddenly fell in love with this elegant side table!﻿ You see, it is 3 layered and all made of mirrors. The only disadvantage of this side table is that it should be handled with enough care as it's so fragile. :) Maybe this design is not applicable to houses of families having toddlers. But on the second thought, if you can handle it well, this can definitely create an impact in your living room. It's so classic and elegant and definitely an "eye catcher". I like the way it was accentuated with lovely decorative pieces and that clear vase with fresh pink flowers is really really gorgeous.